The HPE PremierFlex Network Cable Provides more robust and reliable data transfer, due to their lower sensitivity to sharp bends, which can reduce downtime and operating expense.HP's PremierFlex cables use a bendable fiber technology that significantly improves bend performance over existing fiber cables. 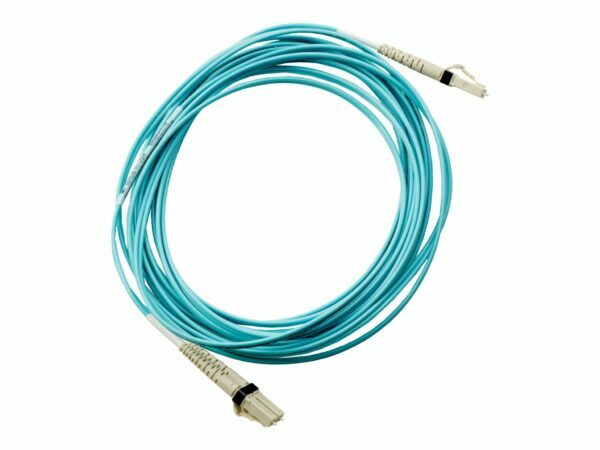 This, combined with improvements in fiber clarity and bandwidth, allows HP PremierFlex cables to transmit data over longer distances, at higher rates, with fewer transmission errors. HPE PremierFlex Network Cable – 16.4 ft is 135% higher bandwidth and less modal dispersion than standard OM3 cables, and 840% higher bandwidth vs. standard OM2 cables. The HPE PremierFlex Network Cable is Less susceptible to signal loss in typical routing applications, which means more up-time, less troubleshooting, and lower operating expense. The HPE PremierFlex Network Cable Provide signal reliability and tolerant of tighter bends needed in compact applications. The HPE PremierFlex Network Cable can be handled more intuitively and have 112% better signal quality than standard OM2/OM3 fiber cables.